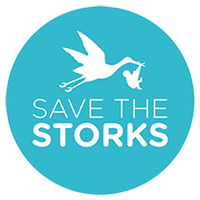 Save the Storks exists to partner with pregnancy resource centers and give abortion-vulnerable women a choice that will change their lives forever. We partner with resource centers all over the nation, providing them with powerful tools and training to more effectively connect with those women in their communities. With the support of people like you, we’ve funded roughly 40 bus projects (20 on the road and 20 in production), gained over 165,000 supporters, and saved over 1,000 babies. 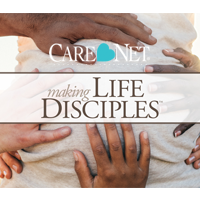 Care Net's Making Life Disciples is the first curriculum that equips your church to minister to women and men considering abortion. It is designed to give your church the training and support you need to serve those who are facing unplanned, unexpected, or unexpectedly complicated pregnancies. The program was crafted out of Care Net's decades of experience supporting thousands of community-based pregnancy centers across North America. Making Life Disciples takes this knowledge and applies it to the unique needs of churches. Through a special partnership with Voiceless, Care Net is offering a 15% discount on the Leader's Kit when you use the code VOICELESS at checkout. Human Coalition is committed to ending abortion in America by rescuing children and serving families in key, abortion-riddled communities nationwide, because every human life – born and preborn – is a unique and precious work of divine art. By using best-in-class business technology, we reach hurting, pregnant women and families facing difficult circumstances, connect them with our in-house contact center, and then schedule an appointment for them at either one of the top-performing life-affirming pregnancy centers in our network, or one of the five women’s care clinics we own and operate. Human Coalition is committed to the child and family even after the crisis has passed. Our Continuum of Care program coordinates long-term assistance through a network of support services already in place to promote a healthy family environment. Students for Life of America (SFLA) is one of the nation’s most active pro-life organizations and the largest youth pro-life organization. We are the only national pro-life organization dedicated to training and equipping college, high school, middle school, medical, and law school students. Our approach is uniquely effective, and the methods we have developed are a combination of time-tested techniques and cutting-edge technology. We work tirelessly equipping students, so that they can defend the preborn and help their mothers on their campuses. Since 2006, we have helped to establish and build over 1,000 student pro-life organizations and have trained tens of thousands of students nationwide. 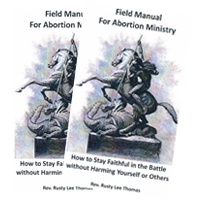 Field Manual for Abortion Ministry is a must read for anyone on the front lines of Pro-Life Ministry or for those who have been called to the Pro-Life Ministry full time. This handbook was written by Rev. Rusty Lee Thomas; the incoming Director of Operation Save America Ministry and is featured as one of "Jesse's" tools in the film.